Inertness and the indiscriminate use of synthetic polymers leading to increased land and water pollution are of great concern. Plastic is the most useful synthetic polymer, employed in wide range of applications viz. the packaging industries, agriculture, household practices, etc. Unpredicted use of synthetic polymers is leading towards the accumulation of increased solid waste in the natural environment. This affects the natural system and creates various environmental hazards. Plastics are seen as an environmental threat because they are difficult to degrade. This review describes the occurrence and distribution of microbes that are involved in the degradation of both natural and synthetic polymers. Much interest is generated by the degradation of existing plastics using microorganisms. It seems that biological agents and their metabolic enzymes can be exploited as a potent tool for polymer degradation. Bacterial and fungal species are the most abundant biological agents found in nature and have distinct degradation abilities for natural and synthetic polymers. Among the huge microbial population associated with polymer degradation, Pseudomonas aeruginosa, Pseudomonas stutzeri, Streptomyces badius, Streptomyces setonii, Rhodococcus ruber, Comamonas acidovorans, Clostridium thermocellum and Butyrivibrio fibrisolvens are the dominant bacterial species. Similarly, Aspergillus niger, Aspergillus flavus, Fusarium lini, Pycnoporus cinnabarinus and Mucor rouxii are prevalent fungal species. Developments in science and technology, especially over the last 2 decades, have led to the production of a number of synthetic polymers worldwide. The polymers are chains of monomers linked together by chemical bonds. Polymers such as lignin, starch, chitin, etc., are present in the environment naturally. Nowadays, synthetic polymers are used in several industries, of which packaging application covers 30% of plastic use throughout the world (Shah et al. 2008b; Dey et al. 2012; Kumar et al. 2011). In the nineteenth and twentieth centuries plastic played a revolutionary role in the packaging industries. Thereafter, approaches to transportation were changed with the introduction of carrying bags made of polyethylene (Nerland et al. 2014). Synthetic polymers are widely used because of their durability and low cost, but disposal of packaging material has emerged as a challenge for solid waste management, and it is a major source of pollution (Song et al. 2009; Dey et al. 2012). Now such types of synthetic compounds have become a nuisance affecting natural resources like water quality and soil fertility by contaminating them (Bhatnagar and Kumari 2013; Ojo 2007; Arutchelvi et al. 2008). In the 1990s, plastic waste was found to have tripled and is continuously increasing in the marine environment (Moore 2008). The level of debris materials increased markedly from 1990 to 1995 on Bird Island of South Georgia; similarly, the garbage amount doubled in the coastline area of the UK during 1994–1998 (Walker et al. 1997; Barnes 2002). It was estimated that neuston plastic increased ten-fold between 1970 and 1980 in Japan (Moore 2008). The total demand for plastic was 107 million tons in 1993, which increased to 146 million tons in 2000. The growth rate of the plastic industry in Pakistan is 15% per annum (Shah et al. 2008b). Plastic waste is being generated rapidly worldwide. The UK, China and India contribute 1 million tons, 4.5 million tons and 16 million tons, respectively (Kumar et al. 2011). India generates around 10 thousand tons of plastic waste (Puri et al. 2013). The annual production of plastic was estimated as 57 million tons in Europe in 2012. Polyethylene is one of the common forms of plastic compared to others (polyvinyl chloride, polypropylene, etc.) (Nerland et al. 2014). Plastic materials have become versatile, competitive and reliable substitutes for traditionally used metal, leather and wood materials in the past 5 decades because of their toughness, flexibility and physical properties (Sivan 2011; Singh and Sharma 2008). Durability and undesirable accumulation of synthetic polymers are major threats to the environment. Plastic waste recycling has largly unsuccessful outcomes; of the over 1 trillion plastic bags dumped per annum in the US, only 5% are recycled. Apparently, waste management (bioremediation) is one of the ways to reduce the adverse effects and can serve as a potential tool (Shah et al. 2008b; Ojo 2007; Ali et al. 2014). In-vitro degradation of synthetic polymers is a time-consuming process (Schink et al. 1992; Bhatnagar and Kumari 2013). Production of synthetic polymers, especially polyethylene (140 million tons per annum), is causing problems with the waste management, and their consumption is increasing day by day at a rate of 12% per annum (Kumar et al. 2011; Sivan 2011; Shah et al. 2008b; Koutny et al. 2006). Plastic waste in the form of litter enters running water in different ways according to nature and ultimately contaminates the marine environment (Obradors and Aguilar 1991). The proliferation rate of plastic materials is very fast, and the marine environment is affected by such wastes throughout the world. Plastic waste causes eight intricate problems in the marine environment: (1) plastic trash pollutes, (2) plastic entangles marine life, (3) ingestion of plastic items, (4) biodegradation of petroleum-based plastic polymers is time-consuming, (5) broken plastic and its pellets disturb the food web, (6) interference with sediment inhabitants, (7) marine litter destroying the primary habitat of new emerging life and (8) marine plastic litter causes major damage to vessels. In a 1970s study on 247 plankton samples in the Atlantic Ocean, 62% of the samples found plastic matter. Similarly, in the North Atlantic during the 1960s–1990s sampling of plankton showed a considerable increase of microscopic plastics in the marine environment (Moore 2008). Polymers are made up from non-renewable as well as renewable feedstock. These polymers are well known for their diverse applications in industries, domestic appliances, transportation, construction, shelters, storage and packaging practices. Such polymers are differentiated according to their chemical nature, structural arrangement, physical properties and applications as shown in Table 1 (Shah et al. 2008b; Dey et al. 2012; Kumar et al. 2011; Smith 2005). Natural polymers are found abundantly in nature in the forms of biopolymers and dry material of plants as shown in Table 2 (Leschine 1995). The constitution of the plant cell wall differs with the composition of the lignocellulosic biomass (cellulose, hemicellulose and lignin), which provides strength (Premraj and Doble 2005). Lignocelluloses play a critical role in developing plant biomass, in which cellulose, hemicellulose and lignin are the major building blocks of the natural polymer (Perez et al. 2002). Plastics are manmade compounds that consist of a long chain of polymeric molecules and unusual bonds, with excessive molecular mass and halogen substitutions. Nowadays plastic manufacturing involves different inorganic and organic materials, including carbon, hydrogen, chloride, oxygen, nitrogen, coal and natural gases (Shah et al. 2008b). The most widely used polymers contributing to plastic waste are low-density polyethylene (LDPE), high-density polyethylene (HDPE), polyvinyl chloride, polystyrene and polypropylene with 23, 17.3, 10.7, 12.3 and 18.5%, respectively, and the remaining 9.7% of other types of polymer (Puri et al. 2013). The polymer production in 2012 was estimated as polyethylene 30% (LLDPE and LDPE 18%, HDPE 12%), polypropylene 19%, polyvinyl chloride 11%, polystyrene 7%, polyethylene terephthalate 7% and polyurethanes 7% worldwide (Nerland et al. 2014). The sales distribution and amount in percentage of synthetic polymer consumed in North America during 1995 and 2004 are shown in Table 3 and Fig. 1, respectively (Summers 1996; Zheng and Yanful 2005). Literature and information on biodegradable products are organized by the US government, with the help of the Biodegradable Products Institute (BPI). BPI is an organization that deals with academia, industry and government bodies that encourage recycling of polymeric materials (biodegradable). Production of the biodegradable polymer involves the addition of starch and plant fiber extract. BPI provides matter to the ASTM (American Society for Testing and Materials) for assembling ASTM standards (ASTM D6400, D6866). These are the principle databases of degradation used to supervise industry. The logo for the compostable product was introduced by the USCC (US Composting Council) and BPI, shown in Fig. 2 (Kolybaba et al. 2003; http://www2.congreso.gob.pe/sicr/cendocbib/con2_uibd.nsf/4EF8A31F2BF5D3480525772A0053CD80/$FILE/Ensayo_biodegradables_pl%C3%A1sticos_by.pdf). Living organisms are involved in the breakdown of plastic material, and consequently the recycled form reverses back to the environment. Anaerobic microbial degradation releases greenhouse gas (methane) in landfills, which increases global warming. Aerobic conditions are essential for fungal degradation while bacterial degradation proceeds in aerobic as well as anaerobic conditions (Kumar et al. 2011; Chandra and Rustgi 1998). Plastic can be reduced in an eco-friendly manner with the help of soil bacteria and proper water availability. Decomposition of the polymer depends on its chemical composition, which supports the growth of microorganisms in the form of nutrient sources. The starch-based polymer is favorable for microbial attack, and hydrolytic enzymes act on the polymer matrix to reduce their weight. Polymer made from starch or flax fiber shows greater biodegradability as compared to other synthetic polymers. Microorganisms also play an important role in the degradation of petroleum-based polymers. Petroleum-based polymers such as polyolefins are degraded through photo-degradation (Kumar et al. 2011; Sen and Raut 2015). Emerging technology is continuously involved in improving the processing of biopolymers by using an additive (benzophenone) during their construction. Additives play a significant role in the chemical process during photo-degradation. Such amendments affect their thermal sensitivity and UV-absorbing capacities. Chemically sensitive polymers have a better biodegradability rate compared to other polymers. Similarly, thermal exposure is also involved in the breakdown of a polymer into simpler forms that increase the availability of microorganisms. Nodax is alkaline in nature and generally involves in the structural change of the polymer (Kumar et al. 2011; Augusta et al. 1993). Renewable resources are also used in the formation of biodegradable materials. Animal and plant originated compounds are susceptible to microbial degradation (Schink et al. 1992). Development of bio-based materials is beneficial for our environment's sustainability, maintenance of greenhouse gas emissions, etc. (Song et al. 2009). This type of material's manufacturing practice plays a significant role in the environment by reducing the amount of dumped polymer waste (Leja and Lewandowicz 2010a, b). Many synthetic polymers are degraded under exposure to solar ultraviolet (UV) radiation, photo-oxidative, thermo-oxidative and photolytic reactions (Singh and Sharma 2008). In the natural environment, hydrolytic properties of seawater, oxidative properties of the atmosphere and sunlight radiation (UVB) make the polymers fragile and eventually break them into smaller pieces (Moore 2008). The American Society for Testing and Materials (ASTM) and International Standards Organization (ISO) provided the analytical protocol for plastic degradation on the basis of alteration in chemical structure and loss of physical properties of plastic (Kumar et al. 2011; http://www2.congreso.gob.pe/sicr/cendocbib/con2_uibd.nsf/4EF8A31F2BF5D3480525772A0053CD80/$FILE/Ensayo_biodegradables_pl%C3%A1sticos_by.pdf). Degradation of polymers is a process that alters the strength and color of polymeric material under controlled conditions. Disruption of the chain length initiates the primary breakdown (aging), and several external factors such as temperature and chemicals also enhance the rate of degradation. The term “aging” is used for the change in properties. It is utilized as polymer recycling, which reduces the outcome of pollution load (Kumar et al. 2011; Bhardwaj et al. 2012a). Anaerobic degradation is another way to dispose of plastic materials through landfilling (Schink et al. 1992; Shah et al. 2008b). Currently, the recycling process is increasing but the recycling rate is very low for most plastic materials because of the use of more additives in their manufacturing (Song et al. 1998). The recycling rate of thermosets is very low but thermoplastics can be easily recycled (Moore 2008). Plastic comprises 60–80% of litter, and its persistence and discharge to the surroundings create harmful effects on wildlife as well as agriculture and forest land. Furans and dioxins are persistent organic pollutants (POPs) and are formed through the burning of polyvinylchloride (PVC). Plastic waste may come from post consumption and different stages of production (Nerland et al. 2014; Shah et al. 2008b). Worldwide research for the last 3 decades has focused on the biodegradation of plastic (Shimao 2001). Biodegradation is compatible (microbial mineralization) compared to other waste management techniques (Schink et al. 1992). Bioremediation serves as the best way to manage waste material in an eco-friendly manner. Polluted sites are increasing constantly because of improper waste management strategies; such waste comes from industrial areas and community activities. Biological agents, both prokaryotic (bacteria) and eukaryotic (fungi, algae and plant), are involved in the bioremediation process. Pseudomonas, Streptomyces, Corynebacterium, Arthrobacter, Micrococcus and Rhodococcus are the prominent microbial agents being used for bioremediation as illustrated in Table 4 (Bhatnagar and Kumari 2013; Kathiresan 2003; Dussud and Ghiglione 2014; Shah et al. 2008a; Kale et al. 2015a, b; Grover et al. 2015; Restrepo-Flórez et al. 2014; Bhardwaj et al. 2012a). Microorganisms break down the compounds into a simpler form through biochemical transformation. Biodegradation of polymer is described as any alteration of the polymer properties such as digestion by microbial enzymes, reduction in molecular weight, and loss of mechanical strength and surface properties, in other words, the breakdown of material into fragments via microbial digestion. Degraded particles are redistributed and probably non-toxic to the environment. In nature, microorganisms form catalytic enzymes for biodegradation (Hadad et al. 2005). This approach is proficient for environmental waste management, and microorganisms involved in this process for oxidation serve as a tangible alternative mode to maintain the healthy environment (Singh and Sharma 2008). The degradation process is accomplished by microorganisms via different enzymatic activities and bond cleavage. This degradation occurs in sequential steps, bio-deterioration (altering the chemical and physical properties of the polymer), bio-fragmentation (polymer breakdown in a simpler form via enzymatic cleavage) and assimilation (uptake of molecules by microorganisms) and mineralization (production of oxidized metabolites (CO2, CH4, H2O) after degradation), which are shown in Fig. 3. Mineralization of polymers takes place in both aerobic and anaerobic conditions. In the aerobic condition, CO2 and H2O are formed, while under anaerobic conditions, CH4, CO2 and H2O are produced (Singh and Sharma 2008). The biodegradation procedure of a few polymers is known (Shimao 2001). Most of the microbial communities are able to utilize polyester and polyurethane at a slower rate (Dey et al. 2012; Schink et al. 1992). Starch- or cellulose-based plastics are biodegradable; they degrade easily through composting, which can reduce landfilling and solve the waste management problem. Biodegradation with the help of microorganisms is an approachable way to clean up such plastic waste. Microorganisms are able to utilize synthetic polymers, but the composition of the polymer and manufacturing process need to be defined for the biological activity on the polymer material (Sivan 2011; Song et al. 2009; Leja and Lewandowicz 2010a, b; Kumar et al. 2011). Biodegradability of synthetic polymers with chemical groups that are susceptible to microbial attack can be carried out with polycaprolactone, poly-β-hydroxyalkanoates and oil-based polymers (Leja and Lewandowicz 2010a, b; Song et al. 2009). Enzymes of microbial origin are employed to control pollution and contribute to developing an eco-friendly environment. Diverse forms of microflora are known to utilize them through the mineralization process. Bacteria and fungi are a widely distributed group of microorganisms that play a significant role in the processing of polymer compounds in the natural environment (Upreti and Srivastava 2003). These microorganisms are used to convert the insoluble biopolymer into a soluble biopolymer. Naturally occurring polymers consist of lipids, carbohydrates and proteins. Microbial enzymes are the ultimate source to hydrolyze only low molecular weight and soluble macromolecules. These soluble compounds are exploited by microorganisms for energy production (Gallert and Winter 2005). Microbial degradation of polymers leads to alteration of the physicochemical properties of materials. The bioconversion or degradation of biomaterials is well understood by studying the mechanical properties, degradation kinetics and recognition of the degraded products. The bioconversion process also alters the efficiency of the host response, cellular growth, material function, etc. (Azevedo and Reis 2005). The tricarboxylic acid (TCA) cycle serves as one of the main metabolic pathways for energy generation from most of the organic compounds. In the TCA cycle, acetyl-CoA acts as the key intermediate and is exploited in cellular activities like CO2 formation by oxidation, acetate formation, biosynthesis, etc. The major contribution of the TCA cycle is to generate ATP and provide energy to the cell. Two molecules of ATP are synthesized by oxidation of 2 mol of acetate, while 34 mol of ATP is synthesized by the electron transport chain (ETC) through phosphorylation. The metabolism and efficiency of energy production vary according to the microbial growth conditions. Aerobic bacteria are able to respire carbohydrates, but one-third of the starting energy is not utilized by the cell and is lost in the form of heat; the remaining energy is conserved biochemically. During the processing of wastewater, activated sludge reactors lose much of their energy as heat. Under growth-limiting conditions, the ATP consumption rate is increased and less energy is available for cellular growth and metabolism (Gallert and Winter 2005). Bode et al. (2000) investigated the physiological and chemical process of biodegradation of synthetic poly (cis-1,4-isoprene) polymer and found that two bacterial strains, i.e., Streptomyces coelicolor 1A and Pseudomonas citronellolis, were able to utilize degraded vulcanized natural rubber and synthetic poly(cis-1,4-isoprene). They observed the growth of these bacteria on polymer was better as compared to Streptomyces lividans 1326, and they were exploited under controlled conditions. Three degraded products have been identified from the culture suspension of S. coelicolor 1A, and vulcanized rubber was used as substrate. These degraded products were determined as (5Z,9Z)-6,10-dimethyl-penta-dec-5,9-diene-2,13-dione, (5Z)-6-methyl-undec-5-ene-2,9-dione and (6Z)-2,6-dimethyl-10-oxo-undec-6-enoic acid. They also proposed the oxidative pathway for conversion of poly(cis-1,4-isoprene) into methyl-branched diketones by following different steps, i.e., aldehyde intermediate to carboxylic acid oxidation, β-oxidation, oxidation of the conjugated bond (double bond) to β-keto acid and the decarboxylation process. The authors proposed a hypothetical model for poly (cis-1, 4-isoprene) degradation as shown in Fig. 4. Similarly, Mooney et al. (2006) studied the microbial degradation of styrene. Styrene is one of the identical xenobiotic compounds and serves as a potent toxic pollutant to the environment as well as human health. It comes from industrial practices that involve polymer and petrochemical processing. Mooney et al. (2006) reported bacterial enzymes involved in styrene biodegradation. The detailed process of styrene bioconversion to its metabolites and degraded products is shown in Fig. 5. Pyruvate, acetaldehyde 2-phenylethanol and 2-vinylmuconate are some of the degradative metabolites obtained during styrene biodegradation. Similarly, phenyl acetyl-CoA obtained via styrene degradation enters into the tricarboxylic acid (TCA) cycle. The TCA cycle thus plays a vital role in energy production, essential for cellular and metabolic events, and also produces CO2 during the oxidation process. Polymer biodegradation depends on the physical and chemical properties of the polymer. Molecular weight and crystallinity are key properties of polymers that affect the biodegradation efficiency of microorganisms. The enzymes responsible for polymer degradation are categorized into two groups, i.e., extracellular depolymerase and intracellular depolymerase (Gu 2003). Exoenzymes are generally involved in the degradation of complex polymers to simple units like monomers and dimers. These are further exploited by microorganisms as energy and carbon sources as shown in Fig. 6. Polymer degradation (mineralization) forms new products during or at the end of processes, e.g., CO2, H2O or CH4. Natural polymers like cellulose, PHB and chitin are susceptible to microbial degradation and serve as biodegradable polymers (Gu 2003; Chahal et al. 1992; Brune et al. 2000). The degradation process depends on the availability of O2. Polymer degradation accomplished under anaerobic conditions produces organic acids, H2O and gases (CO2 and CH4) (Gu 2003). Under aerobic conditions, the biodegradation of the polymer forms CO2 and H2O in addition to the cellular biomass of microorganisms. Similarly, under sulfidogenic conditions polymer degradation forms H2S, CO2 and H2O (Gu and Mitchell 2006; Barlaz et al. 1989; Gu 2003; Merrettig-Bruns and Jelen 2009). The aerobic process is more efficient than the anaerobic process by means of energy production as less energy is produced in anaerobic processes because of the lack of O2, which serves as an electron acceptor, and this is more efficient in comparison to CO2 and SO4 2− (Gu 2003). In solid waste treatments, denitrifiers are categorized as aerobic organisms and used for nitrate or nitrite exploitation. Under anoxic conditions, nitrate or nitrite serves as a terminal electron acceptor in the metabolic respiration process. Extracellular solubilized biopolymers (natural polymers like carbohydrates, lipids and proteins) from CO2 and H2O form during the respiration process, while in anaerobic conditions CO2, CH4, NH3, and H2S are produced from the degradation of soluble carbon compounds via methanogens or sulfate reducers. In anaerobic conditions, if SO4 2− is present, then SO3 2− and CO2 will form. On the other hand, if SO4 2− is absent, then CH4 and CO2 will form under anaerobic conditions (Gallert and Winter 2005; Mohan and Srivastava 2011; Leja and Lewandowicz 2010a, b). A larger amount of CO2 is produced at the lowest pH with lignolytic fungi (Kale et al. 2015a, b). Huang et al. (2005) investigated sludge microorganisms for degradation of polyethylene glycols (PEGs) under aerobic and anaerobic conditions. They studied the effect of molecular weight (MW) on the efficiency of aerobic as well as anaerobic biodegradation processes of polyethylene glycols (MW 600, 6000 and 20,000) and found that aerobic degradation is more efficient than anaerobic degradation by means of PEG degradation abilities; 80% of biodegradability was reported in 5 days under aerobic conditions with diverse molecular weight PEGs. While the PEG biodegradation under the anaerobic condition showed 50% biodegradability of PEG 600 in 9 days, 40% biodegradability of PEG 6000 in 10 days and 80% biodegradability of PEG 20,000 obtained after 6 days of incubation. Huang et al. (2005) further investigated the nutrition effect on the degradation process under anaerobic conditions. The enriched organic media showed its positive effect on PEG 6000 biodegradation by increasing the biodegradability. Similarly, Sridevi et al. (2012) studied the metabolic pathways for phenol biodegradation and found that under aerobic conditions phenol biodegradation can form catechols and serves as intermediate products by ring cleavages at the ortho or meta position. In aerobic conditions, initially phenol is converted into catechol and then intermediates of the central metabolism by ortho or meta fission and catalyzed by catechol 1, 2 dioxygenases or catechol 2,3 dioxygenase, respectively. They found that anaerobic biodegradation of phenol is slower as compared to aerobic biodegradation. In anaerobic biodegradation the end product is CH4 and CO2, and under aerobic biodegradation the end product is CO2. The growth of microorganisms is observed under different environmental conditions. These microorganisms are able to adapt to conditions as experience reflects changes, and they undergo a transition. In normal conditions, plankton is found in free swimming form, and under transition state these assemblages of microorganisms attach irreversibly to the surface and form biofilms. Escherichia coli O517:H7 and Myxococcus xanthus attach to the surface under nutrient-rich environments (O’Toole et al. 2000; Sharma et al. 2015; Simoes et al. 2010). Microorganisms in biofilms show novel phenotypic characteristics, specific mechanisms to attach to surfaces and respond to the external signals. Biofilm formation is a highly synchronized and intricate process, as shown in Fig. 7. Some microorganisms are reported to change their morphology (e.g., Bacillus subtilis, Caulobacter crescentus) under harsh conditions, which allows them to exist in a hostile environment (O’Toole et al. 2000). In the initial stage, microorganisms produce some proteins such as collagen, fibrin, fibronectin and laminin as a coating material, which help in cell-to-cell adhesion in biofilm (Bryers et al. 2006; Simoes et al. 2010). Biofilms exist as a matrix of extracellular polymeric substance (EPS) that depends on the surrounding conditions; it consists of a series of biological and physical changes during matrix formation and from the three-dimensional structure (Prakash et al. 2003; Bryers et al. 2006; Simoes et al. 2010). Microbial species grow on a wide variety of surfaces, i.e., inert or living. Inert surfaces include piping systems (biofilms on noncellular materials), medical devices (biofilms composed of microorganisms with blood components) and living tissues, which have served as surfaces for the development of biofilms and consist of single or mixed populations of microorganisms. Single species of gram-positive (Staphylococcus aureus, Staphylococcus epidermides and enterococci) and gram-negative (E. coli, Pseudomonas aeruginosa, Pseudomonas fluorescens and Vibrio cholerae) bacteria were widely reported for biofilm formation. However, multiple species populations of microorganisms have been reported preponderantly in biofilms (O’Toole et al. 2000; Prakash et al. 2003). Microorganisms that form biofilms show elaborate growth by increasing their antibiotic resistance through gene regulation. Microorganisms reflect unique inhabitance in biofilms with enhanced defense mechanisms against therapeutic agents and drugs, and they relieve their survival under sessile conditions (osmotic stress, desiccation, UV radiation and pH changes) (Prakash et al. 2003; Sharma et al. 2015; Bogino et al. 2013; Simoes et al. 2010). Some dyes are used to visualize biofilm formation, i.e., safarinin and crystal violet. The term surface attachment defective (sad) is used for the group of mutant microorganisms unable to form biofilms (O’Toole et al. 2000). Heterogeneity of the biofilm matrix is one of the distinctive features that maintain the nutritional requirement of biofilms. The matrix is composed of polysaccharides, macromolecules and water, which provide heterogeneity and form enclosed exopolysaccharides in cells; these structures protect the biofilms from the external environment (O’Toole et al. 2000; Prakash et al. 2003). In biofilms, microorganisms are hugely differentiated compared to free-swimming organisms and form multicellular (microcolony) complex structures with interstitial voids (Sivan et al. 2006). Microorganisms are present on the upper layer of biofilms and actively dividing compared to microbes in proximity to the surface and also differ in metabolism. Interstitial voids (water channels) in the matrix help to separate the microbial colonies and facilitate diffusion of nutrients, water, gases, enzymes, waste, signals, etc., throughout the biofilms. The heterogeneity in a matrix is visible in both kinds of biofilms, i.e., single species populations of microbial biofilms and mixed species populations of microbial biofilms (Prakash et al. 2003; Bogino et al. 2013). The structural components, i.e., curli fimbriae, extracellular polymeric substances, outer membrane proteins, flagella and pili, hugely participate and are important for biofilm formation. The relieve form biofilms of flagellated motile bacteria compared to non-motile bacteria and other structural components such as curli and mannose sensitive type I, IV pili (TfP) encoding genes also play an important role in cell-cell or cell-surface attachments. Type IV pili play a significant role in bacterial motility on the surface and are important for quorum sensing. OmpR is reported to be a functional gene that promotes biofilm formation (Prakash et al. 2003; O’Toole et al. 2000; Bogino et al. 2013). Biofilm formation is a highly regulated event, and algC was reported as an alginate-producing gene that enhances the biofilm formation potential by fourfold and is positively regulated by the sigma factor (Kokare et al. 2009). Similarly, some autoinducers play a significant role in biofilm formation and have intra- and inter-species communication, e.g., AI 1, AI 2 and N-acetyl homoserine lactones (Vibrio fisheri or Aliivibrio fisheri). Such cellular communication accomplished in addition to quorum sensing signaling systems, i.e., the Rh1I/Rh1R system observed in P. aeruginosa and the AfeI/AfeR system in Acidithiobacillus ferroxidans (Vu et al. 2009). In addition to extracellular appendages, cellular hydrophobicity plays a key role in surface attachment and biofilm formation (Simoes et al. 2010). Synthetic polymers are resistant to water because of their hydrophobic properties and non-polar nature that prevents water absorption (Khoramnejadian 2013). Usually non-polar polymers show limitations in biodegradation because of their hydrophobic surface properties, and the formation of biofilms overcomes this barrier. Microorganisms are easily attached to non-polar surfaces (plastics and Teflon), which support microbial attachment compared to hydrophilic materials. Non-polar polymer shows an enhanced surface hydrophobicity. The fimbrial structure contains hydrophobic amino acid and mycolic acid of gram-positive bacteria, and the fimbriae are important in establishing the cell attachment to the hydrophobic surface (Prakash et al. 2003; Sarjit et al. 2015). The hydrophobic nature of the surface is one of the major concerns during synthetic polymer degradation and microbial attachment to the surface. In gram-negative bacteria O-antigen has a significant role in governing the hydrophilic properties that hinder the cell attachment to the hydrophobic surface. Inversely, O-antigen of lipopolysaccharides and extracellular polymeric substance (EPS) promotes the cell attachment to the hydrophilic surface (Prakash et al. 2003). Mutants for O-antigen also showed biofilm attachment on the plastic surface, e.g., Bradyrhizobium japonicum mutant (Bogino et al. 2013). In addition to fimbriae, other structures such as the EPS serve as the primary material in the biofilm matrix; it is a hydrated structure and chemically found as colonic acid and alginate in E. coli and P. aeruginosa, respectively (Prakash et al. 2003). Biofilm formation is important for degradation in the natural environment. Biofilm formation on the surface of synthetic polymers facilitates biodegradation (Sivan et al. 2006). Low-density polyethylene (LDPE) serves as the most widely used synthetic polymer. Still, many microorganisms (bacteria, fungi) are known for polymer degradation. Tribedi and Sil (2013a) reported that the degradation of LDPE is done by the Pseudomonas sp. AKS2 strain; it forms a biofilm on the surface of LDPE. Microbial adaptation is a key factor for bioremediation. Biofilm formation depends on the adaptable nature of Pseudomonas sp. AKS2 and shows positive results for LDPE degradation by means of increased hydrolytic activity up to 31%, and the cellular surface hydrophobicity increases by about 26% (Tribedi et al. 2015). Tribedi and Sil (2013a) reported 5 ± 1% LDPE degradation with Pseudomonas sp. AKS2 and enhanced LDPE biodegradation were achieved with biofilm formation. Tribedi and Sil (2013a) conducted an experiment on hydrophobicity and found that Tween 80 had negative effects on hydrophobicity. Sivan et al. (2006) isolated the biofilm-producing bacterial strain Rhodococcus ruber C208 and reported a 0.86% per week biodegradation rate. Orr et al. (2004) reported earlier that mineral oil accelerated the degradation rate up to 50% with R. ruber C208 and enhanced the biofilm potential by increasing microbial colonization on polyethylene surface. Similarly, Penicillium frequentans and Bacillus mycoides exhibited biofilm formation and polyethylene degradation. B. mycoides colonized in a mycelial network formed by P. frequentans on a polyethylene surface. Degradation was determined by percent weight loss, CO2 evolution and gas chromatography (Sangale et al. 2012; Arutchelvi et al. 2008). Metabolic activities of cells in biofilms were studied with the help of fluorescein diacetate (FDA) analysis and ATP assay (Arutchelvi et al. 2008). The development of biofilms was observed and its three-dimensional hydrated microstructure and metabolism examined under confocal scanning laser microscopy with fluorescent in situ hybridization and 16-23S rRNA hybridization (Kokare et al. 2009). Biofilm formation also played an important role in biocontrol. Gene transfer was seen within the biofilms of Streptococcus sp. as conjugative transposons and confers the antibiotic (tetracycline) resistance. The terrestrial system is known for the plentiful production of cellulose biopolymers. The occurrence of cellulose in decaying microorganisms takes place in sundry environments (soil, aquatic, compost, anaerobic digestors and also the carbon cycle) (Leschine 1995). Several microorganisms (bacteria and fungi) were reported to have cellulose-degrading activity, and such cellulose degrading microbes exist in nature with non-cellulolytic microorganisms. Biodegradation of cellulose proceeds under aerobic (form CO2 and H2O) as well as anaerobic (form CO2, CH4 and H2O) conditions (Perez et al. 2002; Nwachkwu et al. 2010). Cellulose is composed of β-1,4 glycosidic linkages between d-glucose subunits. It is found in different forms such as crystalline and amorphous (cellulose chains are non-organized and less resistant to enzymatic degradation) (Perez et al. 2002). Cellulases are the enzymes responsible for the breakdown of β-1,4 glycosidic bonding of cellulose. These cellulases are classified as endoglucanases (EGs or endo-1, 4-b- glucanases) and cellobiohydrolases (CBHs or exo-1,4-b-glucanases) that hydrolyze internal bonding and the end of the chains, respectively. Cellobiose molecules generated from cellulose by the endoglucanases and cellobiohydrolases are hydrolyzed by β-glucosidases and releases two units of glucose. CBHs act on crystalline cellulose effectively. Breakdown of cellulose makes carbon available to microorganisms. Pseudomonas, Streptomyces and Cellulomonas are reported for cellulase activity (Perez et al. 2002; Leschine 1995; Souza 2013; Kameshwar and Qin 2016). Fungal degradation of cellulose was reported with members of Basidiomycetes and Chytridiomycetes (Souza 2013). Fungi are also reported to have cellulase activity, including Phanerochaete chrysosporium and Trichoderma reesei. Anaerobic biodegradation of cellulose is very complex compared to aerobic degradation (Leschine 1995; Souza 2013; Kameshwar and Qin 2016). Larroque et al. (2012) studied CBM1 (carbohydrate-binding module) containing proteins from fungi and Oomycetes (Phytophthora parasitica). In the case of Oomycetes, CBM1 is involved in plant immunity by adhesion to polysaccharide (cellulose) substrates, while CBM1 of fungi is reported for cellulose degradation. Anaerobic degradation contributes 5–10% of the total cellulose-degradation. In the case of anaerobic degradation of gram-positive bacteria, Clostridium thermocellum was reported to have cellulolytic activity, and cellulosome is a functional hydrolytic enzyme unit. Clostridium thermocellum has an excellent cellulose degradation ability in cellulosomal and free-enzyme systems. Carbohydrate-active enzymes (CAZymes) play an important role in their activity and form large protein complexes (primary and secondary scaffoldings) that bond with the cell wall of bacteria. Xu et al. (2016) studied the “cell-free” cellulosomal system and characterized two types of cellulosomal systems by using mutants with scaffolding gene deletions. CipA (primary scaffolding) has a significant role in cellulose degradation compared to other scaffoldings. Xu et al. (2016) also reported that primary scaffolding (CipA) plays a key role in C. thermocellum for cellulose degradation. Pretreatment of cellulose material also makes it susceptible to hydrolysis by reducing the barrier [chemical and physical (UV)] effects (Jonsson and Martín 2016; Arutchelvi et al. 2008). Pretreatments were employed in milling, acid, alkali and other treatments (Karimi and Taherzadeh 2016). Some cellulase genes (9, 45, GH5 family gene) were reported in insects belonging to the taxa Crustacea, Gastropoda and Annelida (Cragg et al. 2015). Blouzard et al. (2007) reported a hydrolytic system for cellulose degradation in Clostridium cellulolyticum and found that hydrolase belongs to the GH2, GH9, GH10, GH26, GH27, and GH59 gene families and cellulases encoding the gene from the GH9 family. GH9 enzymes were purified from E. coli and characterized from one of the enzymes, Cel9 V, belonging to this family, which showed similarity with cellulosomal cellulase, i.e., Cel9E (Ravachol et al. 2014). Berlemont and Martiny (2013) examined 21,985 genes in 5123 bacterial genomic sequences that encode for cellulases and found 24% potential opportunistic strains with 56% β-glucosidases activity throughout all sequences. Maamar et al. (2004) studied the mutant strain C. cellulolyticum cip CMut1 and concluded that the cellulose (crystalline) hydrolyzing genes were located on the ‘cel’ cluster that encodes for cellulases. Lopez-Mondejar et al. (2016) isolated Paenibacillus O199 reported for cellulose deconstruction and studied the O199 enzyme system. The researcher suggested the exploitation of Paenibacillus O199 as a second-generation technology for agricultural waste (lignocellulosic material) management strategies and biofuel production. Dimarogona et al. (2012) reported polysaccharide monooxygenase (PMO) (or GH61) enzymes that enhanced the degradation capacity of cellulases; external electrons are important to accelerate the PMO activity. Some hydrolytic enzymes also play a key role in cellulose degradation, e.g., lytic polysaccharide monooxygenases (LPMOs), CBM33 (carbohydrate-binding module family 33) and cellobiose dehydrogenases (CDHs). Similarly, Zhang et al. (2016) reported carbohydrate-binding module 1 (CBM1) for cellulose degradation; it contains cellulases and is found in coprophilic Podospora anserine (coprophilous fungus) and P. chrysosporium (typical rot fungus). Hemicellulose is a linear and branched heteropolymer polysaccharide that consists of sugars like d-xylose, l-arabinose, d-glucose, d-galactose, d-mannose, d-glucuronic acid, d-galacturonic acid and 4-O-methyl-glucuronic acid, which are linked to each other by β-1,4 glycosidic bonds or rarely by β-1,3-glycosidic linkage (Perez et al. 2002; Leschine 1995; Werner et al. 2014; Giudicianni et al. 2013). Hemicelluloses are found in primary as well as secondary walls of the plant and contribute one-third of the total dry weight of wood (Perez et al. 2002; Jeffrie 1994). In combination with cellulose, it makes up the major part of the plant; thus, it is known as cellulosics or cellulosic waste, which comes from agricultural practices (Petre et al. 1999). Xylans are the most common and abundant hemicelluloses; they are found in hardwood and softwood parts of angiosperms and gymnosperms, respectively (Horn et al. 2012; Hatakka 2005). Xylan polysaccharide consists of a β-1,4-linked xylose backbone with side groups like acetate, arabinofuranose in high amounts and 4-O-methyl-glucuronic acid in lesser amounts (Scheller and Ulvskov 2010; Jeffrie 1994; Menon et al. 2010; Werner et al. 2014; Carrier et al. 2012). Higher xylan degradation was found with carbonic acid and was easier to hydrolyze enzymatically compared to cellulose (Carvalheiro et al. 2008; Perez et al. 2002; Horn et al. 2012). Xylanases remove the side chain wall by attacking the backbone (Jeffrie 1994). Xylan fermentation is accomplished by strains of Ruminococcus flavefaciens, Ruminococcus albus and Clostridium sp. (Coen and Dehority 1970). Xylanases exist in two forms: endo 1,4 β-xylanase and xylan 1,4 β-xylosidase. P. chrysosporium is a white-rot fungus known to produce hemicelluloses that degrade endo-xylanases, acetyl xylan esterases and mannosidases. Heat-stable endo-xylanases are drived from thermophilic fungi, e.g., Thermoascus aurantiacus and Talaromyces emersonii, while Butyrivibrio fibrisolvens (ruminal bacterium) and Bacillus sterothermophilus possess β-xylosidase. Bacillus spp. produces two types of alkaline xylanases, i.e., xylanase N and xylanase A, with an active pH range of 5, 7 and 11, respectively (Perez et al. 2002; Jeffrie 1994; Kameshwar and Qin 2016). Some helper enzymes like xylan esterases, α-1 arabinofuranosidases and α-4 O-methyl glucuronosidases are required for complete degradation (Perez et al. 2002). Endo-xylanase works in combination with acetyl xylan esterase for efficient xylan degradation; these acetyl xylan esterases are derived from Aspergillus niger, Schizophylum commune, Rhodotorula mucilaginosa, Trichoderma reesei and Fibrobacter succinogenes. Similarly, Streptomyces spp. are also reported for α-O-methylglucuronidases production. Phytophthora also produces hydrolytic enzymes that target the hemicellulose (Jeffrie 1994; Souza 2013; Cragg et al. 2015). Mastotermes darwiniensis gut contains approximately 106–107 xylan degrading bacteria (Cazemier 1969). Glycoside hydrolases (GHs) are the key enzymes for hemicellulose degradation by the breakdown of the glycosidic linkages and remove the phenolic, methyl and acetyl esters. Lytic polysaccharide monooxygenases also reported this on hemicelluloses (Cragg et al. 2015). In T. reesei, 200 genes encode for glycosyl hydrolases and are involved in the degradation of hemicellulose and cellulose (Saloheimo and Pakula 2012). Sun et al. (2012) identified 353 genes and 34 proteins (secretary) from Neurospora crassa, which were involved in the breakdown of hemicellulose in the plant cell wall by hydrolytic enzymes. They reported TF and XLR-1 (xylan degradation regulator 1) played a central role in hemicellulose biodegradation by regulating some of the hemicellulase-encoding genes in N. crassa and orthologs to genes found in Trichoderma and Aspergillus, i.e., XYR1 and XlnR, respectively. In addition to the five hemicellulases reported in C. thermocellum, C. fimi and Nasutitermes species, they also have genes involved in the hydrolysis of hemicellulose (French 2009; Kameshwar and Qin 2016). Gene prediction analysis showed 587 gene-encoded enzymes involved in hemicellulose and pectin hydrolysis and 259 ORFs reported for gene (endo-xylanases gene) expression for hemicellulose degradation (Kameshwar and Qin 2016). Lignin is a relatively water-insoluble aromatic heteropolymer complex. It is a phenolic polymer that provides strength to the plant cell wall via increased internal bonding. With its distinct characteristics, it confers resistance against biological stresses (Perez et al. 2002; Leschine 1995; Souza 2013; Petre et al. 1999; Hatakka 2005; Werner et al. 2014). It consists of three monolignol phenyl propionic alcohols, i.e., coniferyl, sinapyl and p-coumaryl. These alcohols present in lignin in the form of guaiacyl, syringyl and p-hydroxyphenyl propanol (Perez et al. 2002; Horn et al. 2012; Giudicianni et al. 2013; Carrier et al. 2012). Softwood lignin has coniferyl alcohol or guaiacyl propanol as the principal component, while lignin of hardwoods consists of guaiacyl and syringyl propanol as the dominant constituents (Perez et al. 2002; Horn et al. 2012; Hatakka 2005). Lignin present in grass contains all three types of propanol units. Polymerization of lignin consists of carbon-carbon linkages, aryl ether linkages and an aryl glycerol β aryl ether structure. At the stage of cell wall maturation, lignin polymers accumulate with a carbohydrate cross-linked complex (Perez et al. 2002; Jeffrie 1994). Degradation of lignin polymer is carried out by specific extracellular enzymatic systems, such as oxidoreductases (Perez et al. 2002; Horn et al. 2012). Alkaline-based solubilization is also effective in lignin degradation (Carvalheiro et al. 2008). P. chrysosporium, Chrysonilia sitophila, P. radiata and Streptomyces sp. are well-recognized producers of peroxidases, which are effective against lignin degradation (Hatakka 2005; Jeffrie 1994). Instead, the well-studied P. chrysosporium, Sporotrichum pulverulentum and P. radiata were also reported for lignin biodegradation (Hatakka 2005; Souza 2013). P. radiata, Coriolis versicolor, P. chrysosporium, brown-rot fungus (Postia placenta) and white-rot fungi (Cyathus bulleri and C. cinnabarinus) produce the extracellular protein that increases the OH groups and makes it susceptible to degradation (Jeffrie 1994; Souza 2013). These hydrolytic enzymes are able to degrade β-aryl ether and methylated lignin (Jeffrie 1994). Manganese peroxidases and laccases are also known to degrade lignin in addition to lignin peroxidases. Manganese peroxidases are synthesized by T. versicolor, Ceriporiopsis subvermispora, Phanerochaete radiate, P. tremellosa and P. chrysosporium. Similarly, D. squalens and Rigidoporous lignosus are the known organisms that synthesized both enzymes, i.e., manganese peroxidases and laccases (Hatakka 2005; Jeffrie 1994; Souza 2013). Pyrococcus (archaeon) having GH12 endoglucanase is reported for lignocellulose degradation at elevated temperature (Cragg et al. 2015). Basidiomycetes (white-rot fungi) and actinomycetes are known for lignin biodegradation by forming peroxidases; these hydrolytic enzymes are accountable for lignin degradation (Souza 2013). Junnarkar et al. (2016) studied the lignin peroxidase (LiP) production at 39 °C by using P. chrysosporium MTCC 787. Enterobacter lignolyticus SCF1 was reported as a novel strain for anaerobic lignin degradation, and lignin was used as the carbon source (Fisher and Fong 2014). In biotechnological studies C. subvermispora (Polyporales) is widely used for selective lignin biodegradation. Agaricales species also serve as a prominent lignin biodegrader. Fernandez-Fueyo et al. (2016) reported lignin degradation with Pleurotus ostreatus. According to Ma et al. (2016), P. ananatis Sd-1 produces ligninolytic relevant enzymes in addition to cellulases and hemicellulases. Pereira et al. (2016) studied the catabolic pathway for β-aryl ether subunits of lignin. This catabolic pathway identified in Sphingobium sp. SYK-6 NAD-dependent dehydrogenases and glutathione-dependent lyase is important for the β-ether degradation pathway by approaching the early and late hydrolytic enzymes. Lignin peroxidases (LiPs) and versatile peroxidases (VPs) are able to hydrolyze the non-phenolic configuration of lignin and laccases and affect the linkage of β-aryl ether bonds (Álvarez et al. 2016). Kato et al. (2015) conducted the anaerobic degradation of lignin-derived aromatics (syringate and vanillate) by methanogenic microorganisms. Polyethylene succinate (PESu) is an aliphatic polyester polymer and is synthesized by the polycondensation of succinic acid and ethylene glycol. In the polycondensation method, initially succinic acid and ethylene glycol undergo esterification in the presence of catalyst (tetrabutoxytitanium) and then polycondensation with a heat stabilizer (polyphosphoric acid) (Chrissafis et al. 2006; Seretoudi et al. 2002). Such polyethylene succinate polymers are hydroxyl terminated elastomers (Shanks and Kong 2012). Wu and Qiu (2012) reported that polyethylene succinate is miscible with other polymers, e.g., polyvinyl phenol, polyethylene oxide and polyhydroxybutyrate. Polyethylene succinate has a melting point of 103–106 °C, glass transition at −11.5 °C and cold crystallization at 55 °C, showing similarity with non-biodegradable polymers like polypropylene (Chrissafis et al. 2005; Tribedi and Sil 2013c). The crystallization nature of polyethylene altered the biodegradation rates of PESu (Seretoudi et al. 2002; Qiu et al. 2003). Polyethylene succinate serves as a biodegradable polyester; it contains ester bonds, which are hydrolyzable in nature and susceptible to microbial attack. The Pseudomonas sp. AKS2 strain was reported for polyethylene succinate degradation due to its enhanced cell surface hydrophobicity, which is serving as a determining factor for surface attachment. Pseudomonas sp. AKS2 cell surface hydrophobicity is important to the interaction between the cell and hydrophobic surface of polyethylene succinate (Liu et al. 2012; Qiu et al. 2003; Tribedi and Sil 2013b). Biostimulation (in situ bioremediation) has constructive effects on PESu degradation by establishing a new community and shows a founder effect (Tribedi and Sil 2013c). Thermophilic actinomycetes were used for polyethylene succinate degradation, and Microbispora were able to degrade polyethylene succinate film in 6 days at 50 °C (Duddu et al. 2015; Seretoudi et al. 2002; Hoang et al. 2007). Tseng et al. (2007) reported thermophilic actinomycetes from Taiwan with 29.0% polyethylene succinate degradation efficiency. Tseng et al. (2007) reported 31 isolates belonging to the genus Saccharomonospora, Streptomyces, Microbispora, Thermoactinomyces and Actinomadura for polymer degradation. Biodegradation of plastic employs different ways, and thermophilic composting serves as a promising method for removal of degradable plastic from the natural environment. Calabia and Tokiwa (2004) isolated a thermophilic microorganism (Streptomyces sp.) from soil and reported poly (D-3-hydroxybutyrate) degradation at 50 °C; Streptomyces sp. also showed a capacity for polyethylene succinate degradation. The strain Bacillus sp. TT96 also serves as a thermophilic polyethylene succinate degrader (Tokiwa et al. 2009). On the other hand, Tezuka et al. (2004) reported the mesophilic microorganisms Bacillus and Paenibacillus for polyethylene succinate biodegradation at a temperature range of 40–45 °C. These bacteria were isolated from aquatic environments. Hazen et al. (2010) also reported that oil-contaminated marine areas supported the growth of hydrocarbon-degrading microorganisms. Similarly, Ishii et al. (2007) suggested some mesophilic microorganisms, Bacillus pumilus, B. subtilis and Paenibacillus amylolyticus, were involved in PESu degradation. Seretoudi et al. (2002) used Rhizopus delemar lipase for enzymatic degradation of polyethylene succinate and found that the crystalline structure altered the biodegradation rate while the molecular weight had no significant effect on degradation. Lipases are the endo enzymes that randomly break the ester bonds. Similarly, the property of microbial serine proteases was reported for polyethylene succinate biodegradation (Lim et al. 2005). Polyhydroxyalkanoates (PHAs) are well-known bacterial-originated polymers and serve as storage polyesters. In abnormal growth conditions, bacterial cells are committed to PHA [3-hydroxybutyrate (PHB) and 3-hydroxyvalerate (PHBV)] production. The 3-hydroxybutyrate (PHB) used in various medical devices was found to accumulate in several bacteria, e.g., Azotobacter vinelandii and Alcaligenes eutrophus. The use of polyhydroxybutyrate in pharmaceutical practices is due to their bio-acceptance in patients (Bonartsev et al. 2007; Leja and Lewandowicz 2010a, b). Polyhydroxybutyrate (PHB) is a polyester and extremely crystalline (>50%) in nature. The melting point of polyhydroxybutyrate is high in contrast to polyesters (Averous and Pollet 2012). Polyhydroxybutyrate serves as an energy storage source for microorganisms. Polyhydroxybutyrate and its copolymer (3-hydroxyvalerate, etc.) are utilized in the production of degradable plastics (Ohura et al. 1999; Shimao 2001; Premraj and Doble 2005). Kadouri et al. (2002) reported three genes in Azospirillum brasilense strain Sp7 that are involved in PHB synthesis, i.e., phbA, phbB and phbC genes for β-ketothiolase, acetoacetyl coenzyme A reductase and PHB synthase, respectively. Biodegradation of PHA is accomplished by microbiological mineralization and generates CO2 and H2O (Bonartsev et al. 2007; Leja and Lewandowicz 2010a, b). Bacterial-originated PHA depolymerases are known, which may help in the breakdown of polymer (polyhydroxyalkanoate). PHA depolymerases are multi-subunit enzymes, and each subunit has a specific property including a signal sequence, substrate-binding domain, catalytic domain and interconnecting domain (fibronectin type III or threonine similar sequence). Instead, the interconnecting domain of PHB depolymerase contains a cadherin-like sequence found in Pseudomonas stutzeri. PHA depolymerases and PHB depolymerases also differ in substrate-binding domains; PHA depolymerases have one domain, while PHB depolymerases have two domains (for a giant substrate). Polymers that contain cyclic or chain (R) oligomers are sensitive to enzymatic (PHB depolymerases) degradation. Alcaligenes faecalis T1 utilizes the oligomer of 3-hydroxybutanoate, and their depolymerase activity was also studied (Ohura et al. 1999; Shimao 2001; Premraj and Doble 2005). Degradation of PHB was also done by Ilyobacter delafieldii in the absence of oxygen (Schink et al. 1992; Jirage et al. 2011). During the cell lysis process, PHB granules are released outside and hydrolyzed by extracellular PHB depolymerase. PHB depolymerases are enzymes that initiate the intracellular degradation of PHBs. In addition to other genes (phaY, phaX, phaW), phaZ is known as the first structural gene for PHB degradation and releases the D-3-hydroxybutyrate monomer, which can be further oxidized by 3-hydroxybutyrate dehydrogenase and the final product assimilated by the TCA cycle (Sharma and Dhingra 2016). Korotkova and Lidstrom (2001) reported the depA and depB genes, which encode PHB depolymerases for PHB degradation. Volova et al. (2010) reported an enhanced biodegradation rate of polymer films under the marine environment (seawater) instead of compact pellets, and Gracilibacillus sp., Enterobacter sp. and Bacillus sp. were identified. Similarly, Mabrouk and Sabryb (2001) found that the marine bacterium Streptomyces sp. SNG9 is involved in PHB utilization. Weng et al. (2011) investigated the biodegradability of PHAs (PHB, PHBV) under controlled conditions (composting) and found that the degradation rate decreases with decreasing percentages of HV (40, 20 and 3%). Oda et al. (1995) reported a Paecilomyces lilacinus fungal isolate and observed the degradation of PHB by secreting PHB depolymerases and glucose/lactose. Aburas (2016) isolated 20 fungal isolates to examine their PHB degradation potential; out of 20 isolates 11 (belonging to Aspergillus, Penicillium, Fusarium, Trichoderma and Alterneria genera) showed the PHB hydrolysis, with Aspergillus oryzae having an optimal PHB degradation potential at 30 °C and pH 6.5 in 1% PHB containing minimal medium. Foster and Tighe (2005) introduced a new hydrolytic system for PHB degradation that served as an accelerated model (70 °C and pH 10.6) and modified the degradation characteristics. Shah et al. (2007) purified the 37-kDa enzyme (PHBV depolymerase) from Bacillus sp. AF3 and found a positive impact on PHBV degradation. Shah et al. (2010) conducted similar studies with Actinomadura sp. AF-555 for PHBV biodegradation and achieved reproducible results for degradation, determined by SEM analysis (roughness and pits on the surface) and FTIR analysis [(cleavage of –C–H bonds and O–R groups or ester (>C=O)]. Biodegradation is carried out on polyesters, formed through ester linkage, and esterases are the enzymes responsible for the breakdown of these linkages found in microorganisms. Some synthetic polyesters and polyhydroxyalkanoates (bacterial polyester polymer) are known for biodegradation (Shimao 2001). The rate of biodegradation depends on the type of polyester. Aliphatic polyesters susceptible to microbial degradation and ester bonds cleave easily under the aqueous condition that releases hydroxyl and carboxylic acid containing monomers. These aliphatic polyesters include microbial susceptible polymers, e.g., PCL, PGA, PLGA and PLA (Sathiskumar and Madras 2011). Medium length monomer units are rapidly mineralized as compared to smaller or longer monomers with the help of A. flavus, A. niger and Pseudomonas sp. (Chandra and Rustgi 1998; Flavel et al. 2006). Microorganisms are capable of breaking the urethane or ester bonds because of the capability of microorganisms to attack the thermoset polymer and utilize it as a carbon source as well as nitrogen source (Zheng and Yanful 2005). The reliability of the polymer degradation rate is greatly impacted by the environmental conditions. The marine environment consists of different trophic levels; it is observed that the polyester (PCL, PHB/V) sample was ruined after 12 months incubation in the deep sea (Sekiguchi et al. 2011). Hazen et al. (2010) reported that the plume of hydrocarbon in sea depths stimulated the growth of ϒ-proteobacteria. ϒ-Proteobacteria was reported as an indigenous petroleum degrading bacteria from the depth of the sea, and such oil contaminated places are known sources for hydrocarbon degrading genes. Sekiguchi et al. (2011) reported five bacterial species from the Tenacibaculum, Alcanivorax and Pseudomonas genus for polyester (PCL) degradation. Yagi et al. (2014) reported eubacteria and archaea are involved in anaerobic degradation of polyesters (PCL, PLA). Mesorhizobium sp. and Xanthomonadaceae bacteria were identified as PLA degrading eubacteria, and A. thereius was involved in PCL degradation. Archaea Methanosaeta concilii and Methanobacterium petrolearium are involved in anaerobic biodegradation of PLA and PCL, respectively. Zafar et al. (2014) studied commercial composting for polyester (polyurethane) degradation at maturation phase and found that low temperature supports the fungal growth on the surface of the polymer and also in compost. Polyester (polyurethane foam) also is a huge environmental problem and one of the major challenges to waste management. Pseudomonas chlororaphis ATCC 55729 effectively degraded polyester polyurethane foam in in vitro conditions (Gautam et al. 2007). Nakajima-Kambe et al. (1999) reported using strain Comamonas acidovorans TB-35 for PUR esterase production, which is involved in polyester-polyurethane degradation. Degradation was accomplished via hydrophobic substrate binding and the catalytic domain of PUR esterase. Both of the domains play key roles in polyester-polyurethane hydrolysis. Gene pudA from C. acidovorans TB-35 encoded the enzyme PUR esterase. Polylactic acid (PLA) is a polymer used in medicine and also biodegradable plastics. Bacillus brevis, Amycolatopsis sp. Fusarium moniliforme, Penicillium roquefort and B. brevis participate in polylactic acid biodegrading (Ikada and Tsuji 2000; Tomita et al. 1999; Shah et al. 2008b). Production of polylactic acid through the polymerization of the monomer of lactic acid is shown in Table 5. Lactic acid (hydroxyl carboxylic acid) is a basic component of aliphatic polyester polymer (polylactic acid). It is a bio-based bacterial fermented product. Fermentation dependent l or d forms of lactic acid contribute to the formation of several forms of polylactic acid and its derivative. T16-1 strain of Actinomadura keratinilytica NBRC 104111 reported for production of PLA-degrading enzyme Amycolatopsis sp. also shows ~60% degradation of PLA film degradation within 14 days (Babul et al. 2013; Garlotta 2002; Sukhumaporn et al. 2012; Pranamuda et al. 1997). Similarly, Prema and Uma (2013) reported mesophilic bacteria Bacillus amyloliliquefaciens for the degradation of polylactic acid. Iovino et al. (2008) investigated aerobic biodegradation of polylactic acid under a composting environment and checked the effect of the presence of thermoplastic starch (TPS) and short natural fibers (coir). In the initial stage, TPS degrades faster than PLA, and TPS is most susceptible to degradation as compared to PLA. Particle size is also an important factor for biodegradation; fine particles (nano-particles) involve a complex mechanism as compared to micro-particles (Kunioka et al. 2006). Pranamuda et al. (1997) isolated Amycolatopsis and studied it for PLA degradation, finding 60% degradation of PLA film within 14 days. PLA depolymerase of Amycolatopsis sp. serves as a protease instead lipase and degrades casein silk fibroin and Suc-(Ala) 3-pNA. In addition to Amycolatopsis, Saccharotrix was also reported for PLA degradation (Tokiwa et al. 2009). According to Hidayat and Tachibana (2012) 12, 21, 30 and 48% polylactic acid degradations in 1, 2, 3 and 6 months, respectively, were achieved with P. ostreatus. Biodegradation of lactic acid polymers and its copolymers was widely affected by the amount of lactic acid content in polymers. Different fungal species were reported for lactic acid and its copolymer degradation, e.g., Rhizopus sp., Mucor sp., Aspergillus sp. and Alternaria sp. Eubeler et al. (2009) found the effect of UV irradiation on enzymatic hydrolysis of polylactic acid. The researchers expected that UV irradiation caused a chain alteration by C=C bonds formation. Proteinase K seemed to cause enzymatic breakdown of polylactic acid. Copinet et al. (2004) reported that higher temperature and relative humidity increase the hydrolytic rate and found UV irradiation (315 nm) also improves the biodegradation of PLA. Masaki et al. (2005) used the lipase for polylactic acid degradation; this hydrolytic enzyme was purified from strain Cryptococcus sp. S-2 and lipase showed similarity to cutinase family proteins. R. delemar lipase also boosts the PLA breakdown process (Tokiwa et al. 2009). Chaisu et al. (2015) examined dye containing polylactic acid films and found that enzymes from Aneurinibacillus migulanus show the same activity as proteinase K for polylactic acid degradation at 30 °C. Proteinase K was purified from Tritirachium album and served as a potent hydrolyzing enzyme for PLA degradation including L-PLA and DL-PLA (Tokiwa et al. 2009). Strain Pseudomonas tamsuii TKU015 was isolated from Taiwanese soil and reported for the production of PLA depolymerase; it is an important enzyme responsible for polylactic acid waste recycling. Optimum temperature and pH for PLA depolymerase activity are 60 °C and 10, respectively. Liang et al. (2016) purified the 58-kDa PLA depolymerase from Pseudomonas tamsuii TKU015. Sangwan and Wu (2008) exploited molecular techniques and reported genera Thermopolyspora, Thermomonospora and Paecilomyces for PLA degradation under controlled (aerobic) composting. Polycaprolactone (PCL) was widely used in the field of medical science as an elastic biomaterial. Polycaprolactone is a semicrystalline polyester prepared ring-opening polymerization or via free radical ring-opening polymerization of ε-caprolactone and 2-methylene-1-3-dioxepane, respectively. Degradation of polycaprolactone homopolymer depends on its molecular weight. The glass transition temperature and melting point are −60 °C and 55–60 °C, respectively (Woodruff and Hutmacher 2010; Gajanand et al. 2014). PCL containing aliphatic ester linkages is susceptible to hydrolytic degradation but it seems that the PCL biodegradation process takes a lot of time (Gajanand et al. 2014). Mineralization and hydrolysis of polycaprolactone were done by the enzymatic activity of fungi (Chandra and Rustgi 1998). Structural arrangement of PCL affects the enzymatic degradation potential. The growth and enzymatic hydrolysis by Penicillium funiculosum and A. flavus were seen in an amorphous region of PCL (Tokiwa et al. 2009). Polylcaprolactone is sensitive to enzymes, e.g., esterases and lipases; degradation was achieved by these enzymes (Ianuzzo et al. 1977; Shimao 2001). Lipase derived from R. delemar showed a slow degradation rate for PCL because of having a higher molecular weight. Other lipase producing species, R. delemar, R. arrizus Achromobacter sp. and Candida cylindracea. Penicillium sp., are also reported for degradation (Tokiwa et al. 2009). PCL depolymerases are also responsible for the degradation of polylcaprolactone (synthetic polymer) found in bacteria (Nishida and Tokiwa 1993; Suyama et al. 1998). Blended PCLs have a greater degradation rate when employed with 5% sebacic acid (Salgado et al. 2011; Tokiwa et al. 2009). Fungi are widely reported for the biodegradation of PCL and hydrolysis. PCL showed susceptibility to enzymatic degradation; however, the hydrolysis of the homopolymer is a time-consuming process (Averous and Pollet 2012). Aspergillus sp. strain ST-01 investigates for PCL degradation and absolute biodegradation of PCL accomplished at 50 °C within 6 days (Tokiwa et al. 2009). Fungal (pathogenic for the plant) derived cutinases are responsible for plant cuticle (polymer) degradation, and phytopathogenic fungi are also known for their activity against polylcaprolactone, which may be due to the presence of cutinases and structural similarity between two cutin monomer units and PCL trimer. Breakdown of polymers (polylactate and polymalate) involves substrate-specific enzymatic cleavage through extracellular enzymes (Shimao 2001; Schink et al. 1992; Murphy et al. 1996). Benedic et al. (1983) reported yeast Cryptococcus laurentii for the biodegradation of PCL and concluded that the presence of casamino acids enhanced the degradation. Similarly, Motiwalla et al. (2013) reported Bacillus pumilus for the production of proteases, lipases and PCL degradation. Sekiguchi et al. (2011) identified genus Tenacibaculum, Alcanivorax and Pseudomonas from the deep sea environment and reported in vitro biodegradation of PCL. Clostridium botulinum and Alcaligenes faecalis were also recognized for PCL degradation (Caruso 2015; Tokiwa et al. 2009). Oda et al. (1995) observed 10% degradation of the PCL by P. lilacinus D218 within 10 days. P. lilacinus D218 releases PCL depolymerases in addition to PHB depolymerases in PCL and PHB containing media. Optimum activity of PCL depolymerases was observed at 30 °C and a pH range between 3.5 and 4.5 (Oda et al. 1995). Yagi et al. (2009) conducted anaerobic biodegradation of PCL at 55 °C with sludge (diluted 0.86% and undiluted 1.73%) and observed the 92% degradation of 10 g PCL having particle size 125–250 µm. Yagi et al. (2009) concluded the particle size was inverse to the biodegradation rate of PCL. Polyurethane (PUR) was prepared through polyaddition of diisocynate. The urethane bond involves a chain linkage of large molecular weight polymers (~200 as well as 6000). These large molecular weight polymers are polyether PUR and polyester PUR susceptible to microbial degradation (Shimao 2001). Polyethylene adipate (PEA) also serves as a polymer that comprises urethane bonding, which is originally a pre-polymer of PUR (Bhardwaj et al. 2012b). Ureases, esterases, proteases and lipases were classified for PUR hydrolysis via ester bond cleavage. Trichoderma sp. utilized the PUR as a substrate by producing ureases. Similarly, Aspergillus terreus and Chaetomium globosum were observed for the production of urethane and esterase that hydrolyzed the PUR (Bhardwaj et al. 2012b; Howard 2012). Loredo-Trevino et al. (2011) studied 22 fungal strains and found maximum urease activity in most of thm (95%), while the enzymatic activity of laccase, esterase and protease was observed in 36, 50 and 86% strains, respectively. Monooxygenase cleaves the ether linkages of the polymer of polyether. Acetaldehyde forms during ether linkage conversion with the help of sulfate-reducing bacteria. Fusarium solani and Candida ethanolica were identified as dominant species on the surface of polyurethanes (Schink et al. 1992; Zafar et al. 2013). Curvularia senegalensis showed more degrading activity as compared to others (Howard 2002). Proteolytic enzymes, i.e., urease and papain, were found to degrade polyurethane (medical polyester) (Bhardwaj et al. 2012b). In addition to papain, subtilisin was also reported for its involvement in polyurethanes degradation (Chandra and Rustgi 1998). The growth of C. acidovorans was observed on a PUR substrate and exploited as nitrogen and sole carbon; the extracellular membrane bound enzymes have a key role in PUR hydrolysis (Howard 2012). C. acidovorans TB-35 led to the biodegradation of polyester PUR and diethylene glycol and adipic acid were found as degraded products. Cell bound enzymes are responsible for PUR degradation and isolated from C. acidovorans. The gene for such enzymes encodes 548 amino acid protein and contains hydrophobic domains for polymer surface attachment, the catalytic domain, lipase box and signal sequence. In previous studies, bacterial species were less reported for PUR degradation in comparison to fungi, e.g., Arthrographis kalrae, Aspergillus fumigatus, A. niger, Emericella, Lichthemia, Fusarium solanii, Thermomyces, Corynebacterium sp., Neonectria, Plectosphaerella, Phoma, Nectria, Alternaria and P. aeruginosa, and bacteria from genera Bacillus and Comamonas also served as polyurethanes degrader (Shimao 2001; Chandra and Rustgi 1998; Flavel et al. 2006; Zafar 2013; Akutsu et al. 1998; Bhardwaj et al. 2012b). Shah et al. (2008a) isolated the bacteria from soil samples and examined them for polyurethane degradation. Isolates were characterized and identified Bacillus sp. AF8, Pseudomonas sp. AF9, Micrococcus sp. 10, Arthrobacter sp. AF11, and Corynebacterium sp. AF12. All the isolates exploited PUR as carbon source, and degradation was determined via esterase activity and CO2 estimation through the Sturm test, and further structural and chemical changes were examined by means of SEM and FT-IR analysis, respectively. Upreti and Srivastava (2003) observed the growth of A. foetidus on polyurethane and investigated the PUR biodegradation by means of reduction in its tensile strength and tensile modulus. Ma and Wong (2013) studied the esterase activity of A. flavus for polyester polyurethanes degradation. Ma and Wong (2013) exploited esterase genes from A. flavus transfer to the P. pastoris for mass production of esterase; it may also speed up the PUR degradation rate as compared to A. flavus. Genes pueA and pueB played an extreme role in PUR degradation, as determined by conducting different gene silencing and cloning analyses with P. chlororaphis and E. coli (Howard 2012). These genes are located along with the cluster of the ABC transporter gene and seven open reading frames. According to gene silencing experiments, Howard et al. (2007) suggested pueA played a significant role in increasing the cellular density, which enhanced the PUR degradation. Enzymatic secretion of these enzymes followed the Type I secretion system that employed C-terminal hydrophobic secretion signals and glycine-rich RTX motifs, which played the critical role in stabilizing the Ca2+ roll structure. The exact mechanism of the ion roll structure is contentious; it may help with proper alignment of the signal and their secretion (Howard 2012). Gene pueA cloned from the P. chlororaphis to E. coli is encoded for the extracellular enzyme that is secreted from the cloned E. coli cell. The recombinant product of pueA showed similarity with the Group I lipases. Group I lipases and serine hydrolases are widely distributed PUR hydrolyzing enzymes that form a serine triad structure in addition to histidine and aspartate/glutamate (Howard 2012). Stern and Howard (2000) exploited the pT7-6 vector for subcloning the gene transfer that encoded a 65 kDa protein and displayed serine hydrolase characteristics. Pestalotiopsis microspora is another instance of the production of serine hydrolase with PUR exploited as the carbon source (Bhardwaj et al. 2012b). Howard (2012) isolated soil microorganism P7, which was identified as Acinetobacter gerneri by 16S rRNA sequencing and reported for polyurethane degradation. Howard (2012) characterized and determined the 66-kDa enzymes involved in polyurethane hydrolysis and enhanced substrate specificity was increased with of p-nitrophenylpropanate, while ethylenediamine-tetra acetic acid and phenylmethylsulfonylfluoride showed a negative effect by inhibiting the enzyme activity. Polyurethanase (48 kDa) encoding genes were reported in E. coli for successfully cloning and expression. Polyvinyl alcohol (PVA) is a typical polymer like polyethylene and polystyrene made up by linkage of the carbon–carbon bond. It can be used in several tasks as it is converted into different shapes due to its thermoplasticity and also can be used as a biodegradable transportation system due to its water-soluble nature (Shimao 2001). The Pseudomonas strain having alcohol peroxidase activity is involved in enzymatic mineralization of polyvinyl alcohol. Acinetiobacter and Flavobacterium bacterial strains show similar activity on polyvinyl alcohol (Chandra and Rustgi 1998). Fungi Fusarium lini is known to synthesize dehydratase, which is responsible for polyvinyl alcohol degradation and liberates carbon dioxide in addition to water. Pseudomonas O-3, Pseudomonas vesicularis PD, Sphingopyxis sp. PVA3, Pseudomonas sp., Bacillus megaterium, Bacillus sp., Alcaligenes faecalis and Alcaligenes sp. were also identified as a polyvinyl alcohol degrader (Pajak et al. 2010; Rong et al. 2009; Raghul et al. 2013). Biodegradation of polyvinyl alcohol through Pycnoporus cinnabarinus (white rot fungus) was higher when polyvinyl alcohol was employed with a combination of chemical pretreatments, which enhance the degradation (Larking et al. 1999). Raghul et al. (2013) isolated bacteria and investigated PVA-LLDPE degradation. These bacteria were used as a consortium (Vibrio parahemolyticus, Vibrio alginolyticus), polymer degradation by means of reduction of the tensile strength and surface erosion analysis determined by SEM micrographs. Husarova et al. (2010b) employed TGGE (temperature gradient gel electrophoresis) for the analysis of bacterial populations during the degradation of PVA. PVA was found as a potent pollutant in wastewater, and its clearance from wastewater is an important part of maintaining the water quality. Rong et al. (2009) discussed bacterial isolation from activated sludge and identified Novosphingobium sp. P7. Novosphingobium sp. P7 showed PVA degradation in the presence of methionine in medium. On the other hand, Novo-sphingobium sp. P7 is capable of degrading PVA without methionine when cultured with Xanthobacter flavus B2. Sphingopyxis sp. PVA3 and Pseudomonas sp. A-41 form activated sludge, also seen for PVA degradation (Agrawal and Shahi 2015; Fukae et al. 1994). Similarly, Marusincova et al. (2013) reported on Steroidobacter sp. PD for a municipal wastewater treatment plant, and their growth was also observed in denitrifying conditions. PVA degradation with Steroidobacter sp. PD was accomplished in both environmental conditions (aerobic and denitrifying conditions). Matsumura et al. (1994) isolated Alcaligenes faecalis KK314 for PVA breakdown degradation determined by means of stereoregularity. Tsujiyama et al. (2011) cultivated Flammulina velutipes in liquid and quartz sand for PVA utilization. Patil and Bagde (2015) isolated and characterized the bacteria from plastic wastes as Bacillus sp. and Pseudomonas sp. degradation analysis involved the CO2 evolution test and spectrophotometric techniques. Biodegradation of PVA with Bacillus sp. and Pseudomonas sp. were observed as 65 and 42% in 20 days, respectively. Larking et al. (1999) examined the effect of chemical treatment on PVA biodegradation and found a constructive effect of Fenton’s reagent (chemical treatment) on the PVA biodegradability rate of Pycnoporus cinnabarinus (white rot fungus). Chen et al. (2007) investigated the mixed culture of microorganisms from sludge samples and found their great potential to degrade PVA (low polymerization and high saponification). Intracellular and extracellular PVA hydrolyzing enzymes are capable of degrading PVA and form molecules that were detected and examined in the cellular extract. They studied two strains from the mixed culture and found their capability to degrade PVA1799; instead PVA124 and PVA124 showed resistance to degradation by these two strains. Hirota-Mamoto et al. (2006) identified the gene pvaA involved in PVA degradation by encoding the PVA dehydrogenase. They used the Sphingomonas sp. 113P3 strain for purification of PVA dehydrogenase (pvaA) and cloned the pvaA gene in E. coli with a hexahistidine tag that showed similar features as the pvaA gene reported from the Sphingomonas sp. 113P3 strain. PVA dehydrogenase was also reported from some other strains, e.g., Pseudomonas sp. VM15C, Xanthomonas sp. and Azoarcus sp. EbN1. Shimao et al. (2000) investigated the genes pvaA and pvaB of Pseudomonas sp. VM15C that encoded for PVA hydrolyzing enzyme, i.e., PVA dehydrogenase and oxidized PVA hydrolase, respectively. The protein was encoded by gene pvaB, having serine hydrolase characteristics. Oxidized PVA hydrolase degrades PVA in combination with the gene product of pvaA. PVA degradation was reported for both extracellular PVA oxidase and periplasmic PVA dehydrogenase. Periplasmic PVA dehydrogenase is widely distributed in gram-negative bacteria (Kawai and Hu, 2009). Similarly, Hu et al. (2007) reported PVA degradation by the Sphingopyxis sp. 113P3 strain and observed that PVA with lower molecular size degrades faster as compared to average molecular size PVA. Periplasmic PVA dehydrogenase was found as an active enzyme of Sphingopyxis sp. 113P3 that hydrolyzes PVA. Polyethylene glycols (PEGs) are extensively used in biomedical applications, drug delivery, biosensor materials and fabrication applications (Datta 2007). Polyethylene glycols act as plasticizers with molecular weight of 6000. P. aeruginosa, P. stutzeri and Sphingomonas sp. are involved in polyethylene glycol mineralization and symbiotically by Rhizobium sp. and Sphingomonas terrae (Smith 2005). Aerobic biodegradation of polyethylene glycols in fragmented form is carried out through the extracellular enzymatic activity of P. aeruginosa strains. P. stutzeri JAl001 strain is recognized as a biodegrader of polyethylene glycols (M.W. 13,000–14,000). Desulfovibrio desulfuricans, Bacteroides sp., Flavobacterium sp. and the consortium of Pseudomonas sp. with Flavobacterium sp. are also able to degrade polyethylene glycols (Ojo 2007; Flavel et al. 2006). Sphingomonas sp., P. aeruginosa and P. stutzeri microorganisms are reported to have high molecular weight (4000–20,000) PEG degradation. Alcohol dehydrogenase of strain Rhodopseudomonas acidophilia M402 seemed to hydrolyze PEGs. Kawai et al. (2010) identified five genes in peg operon system genes that are responsible for PEG degradation, and they were recognized and cloned. These genes, in the presence of PEG and araC, act as a regulator. The PEG carboxylate dehydrogenase encoding gene also helped in PEG metabolism and was found in the downstream region of peg operon. Ether linkage showed susceptibility to several bacterial enzymes, e.g., ether hydrolase, peroxidase, monoxygenase, glycolate oxidase and laccase. Charoenpanich et al. (2006) studied the dual regulation operon system Sphingopyxis macrogoltabida 103 for PEG degrading genes (pegB, C, D, A and E) and found regulator gene pegR encoding AraC-type regulator. PEGs serves as an inducer for pegA promoter and pegR promoter; it also induces the pegB promoter in additional oligomeric ethylene glycols. The pegB promoter having a regulator (AraC/XylS) binding site played the key role in the transcription of peg operon. Instead, AraC/XylS-type regulator and GalR/LacI-type regulator served to bind pegA promoter and pegR promoter, and the peg operon worked actively. Tani et al. (2007) reported S. macrogoltabida 103, S. macrogoltabida 203 and S. terrae for PEG degradation. The genes peg B, C, D, A, E and R observed from these strains served as PEG hydrolyzing genes that encoded the receptor protein and enzymes, e.g., dehydrogenase, permease and ligase. Gene pegC reported in strain S. macrogoltabidus 103 encoded the enzyme aldehyde dehydrogenase located upstream of pegA. Ohta et al. (2005) discussed the expression of aldehyde dehydrogenase in Escherichia coli, and a cloned enzyme showed similarity to NAD (P)-dependent aldehyde dehydrogenase. They reported this enzyme as a novel nicotinoprotein aldehyde dehydrogenase from S. macrogoltabidus 103, and, activated by Ca2+, that enzyme was involved in PEG degradation. On the other hand, Ohtsubo et al. (2015) sequenced the complete genome of Sphingopyxis macrogoltabida (NBRC 15033); they did not find the gene pegA in peg operon is involved in PEG degradation. Sugimoto et al. (2001) purified and characterized the dye-linked dehydrogenase from S. terrae and initiated the enzymatic degradation of PEG by oxidizing the terminal alcohol. They cloned the pegA gene in E. coli and purified the recombinant enzyme as a homodimeric protein (58.8 kDa) that bound to flavin adenine dinucleotide. PEG dye-linked dehydrogenases serve as a novel type of flavoprotein alcohol dehydrogenase. Frings et al. (1992) discussed two bacteria, i.e., Pelobacter venetianus and Bacteroides PG1, for anaerobic degradation of PEG. Diol dehydratase and PEG acetaldehyde lyase are hydrolyzing enzymes identified in P. venetianus; oxygen and citrate/sulfhydryl compounds showed their sensitivity and optimum effect, respectively, for both enzymes. Bacteroides PG1 has PEG acetaldehyde lyase similar to P. venetianus. Polyethylene is the most utilized form of synthetic polymer and highly hydrophobic in nature (Mahalakshmi et al. 2012). In the case of polyethylene, the biodegradability is inverse to its molecular weight. Less than 620 molecular weight hydrocarbon oligomers favor the growth of microorganisms; high molecular weight polyethylene is resistant to biodegradation. Its hydrophobic nature hinders its bioavailability. Some physical and chemical treatments used before biodegradation increase its effectiveness. Such treatments include UV irradiation, photo-oxidation, thermal treatment and oxidation with nitric acid. Oxidation of polyethylene raises the surface hydrophilicity, which ultimately increases the biodegradation (Hadad et al. 2005). Chemical treatments (0.5 M HNO3 and 0.5 M NaOH) of polyethylene accelerate the biodegradation by Pseudomonas sp. (Nwachkwu et al. 2010). Polyethylenes and polystyrenes with ether linkage are susceptible to monooxygenases attack (Schink et al. 1992). Biodegradation of polyethylene enhanced by the physical treatments causes pre-ageing via light or heat exposure. A hot air oven was used for abiotic oxidation and created a molecular weight distribution at 60 °C followed by incubated with polymer degrading microorganisms. Genera Gordonia and Nocardia are associated with the biodegradation process (Bonhommea et al. 2003). Some genera are also reported for polyethene degradation (Bacillus, Lysinibacillus, Pseudomonas, Staphylococcus, Streptococcus, Micrococcus, Streptomyces, Rhodococcus, Proteus, Listeria, Vibrio, Bravibacillus, Serratia, Nocardia, Diplococcus, Moraxella, Penicillium, Arthrobacter, Aspergillus, Phanerochaete, Chaetomium and Gliocladium) (Arutchelvi et al. 2008; Grover et al. 2015; Koutny et al. 2006; Bhardwaj et al. 2012b; Restrepo-Flórez et al. 2014). Polyethylene is utilized as a carbon source by microorganisms, and biofilm formation on it shows their effectiveness. Biofilm formation improved with the addition of mineral oil (0.05%) to the medium. Nonionic surfactants can promote the polymer biodegradation by increasing the hydrophilicity of the polymer, which helps in the adhesion of microorganisms on the polymer (Hadad et al. 2005). Polyethylene can be degraded by hydro- or oxo-biodegradation. The biodegradation method depends upon the ingredients used in the formation. Fungi (Mucor rouxii NRRL 1835, A. flavus) and strains of Streptomyces are also involved in starch-based polyethylene degradation. Degraded polymers are explained by surface fractures, bond scratching and other changes like color, etc., and such alterations examined by scanning electron microscopy and FT-IR. Degraded polymer shows conformational changes in its texture that support the wideness of the microbial population (Mahalakshmi et al. 2012). Streptomyces badius 252 and Streptomyces setonii 75Vi2 have the ability to degrade lignocelluloses while Streptomyces viridosporus T7A acts on heat-treated degradable plastics (Pometto et al. 1992). Abiotic factors play an important role in increasing the surface availability for microbial growth on polymers; these factors include photo-oxidation, physical disintegration and hydrolysis that cause decreasing molecular weight (Singh and Sharma 2008). R. ruber degrades polyethylene via colonizing on them and forms a biofilm (Basnett et al. 2012). Peroxidant additives are employed in polyethylene manufacturing for agriculturally used plastic, this type of polyethylene showing susceptibility to thermal and photochemical mineralization in vitro. In addition to UV and heat treatments, it reduces the strength of hydroxyls and carbonyls by changing their structure (Feuilloley et al. 2005; Li 2000). P. chrysosporium and Streptomyces sp. are known to degrade starch-blended polyethylene (Flavel et al. 2006). Similar results were reported by Psomiadou et al. for starch-blended LDPE degradation by means of a reduction in mechanical properties (Psomiadou et al. 1997). Arvanitoyannis et al. (1998) attempted to make biodegradable blended LDPE with starch and found that starch 10% (w/w) content in blended LDPE enhanced its biodegradation rate by altering the mechanical properties. Microorganisms take part in degradation via modification of their metabolic functional pathways according to environmental conditions to utilize xenobiotic compounds. A bioremediation process is more affordable by discovering novel catabolic mechanisms (Ojo 2007). The biodegradation process is slow but this does not indicate that ingredients in plastic material and polymers are not bioactive. Polycarbonate plastics undergo leaching of bioactive bisphenol-A monomer when undergoing salt exposure in seawater. Commercial use of several synthetic polymers made with bioactive additives monomers, which are non-stick compounds; softeners and UV stabilizers are found in nature. Their degradation rate depends on the environmental circumstances. Symphony is a type of polymeric material that is used in polyethylene formation and degradable in nature (Moore 2008; Kumar et al. 2011). Yoon et al. (2012) isolated low molecular weight polyethylene degrading bacteria and identified Pseudomonas sp. E4. They found 28.6, 14.9, 10.3 and 4.9% carbon mineralized from different molecular weight (1700, 9700, 16,900, 23,700) polyethylene samples within 80 days at 37 °C that evolved CO2. The alkB gene encoded the enzyme alkane hydroxylase, and Yoon et al. (2012) cloned the alkB from Pseudomonas sp. E4 to E. coli strain BL21 and found their carbon mineralization potential as 19.3% in 80 days at 37 °C. Yoon et al. (2012) concluded that alkB gene played a key role in polyethylene degrading. Santo et al. (2013) reported bacterial originated copper-binding laccase from R. ruber for enzymatic degradation of polythene. 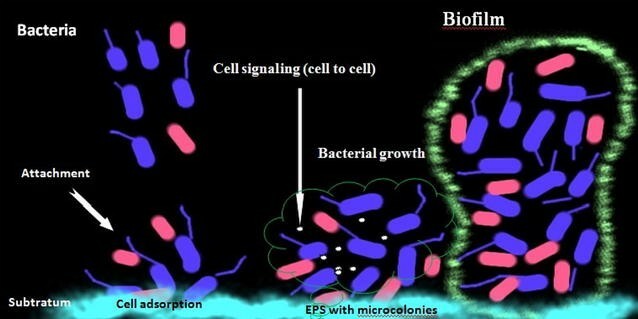 Nowadays different groups of microorganisms are reported for biofilm formation. Similarly, Tribedi et al. (2015) studied Pseudomonas sp. AKS2 for biofilm formation and reported LDPE degradation. They found enhanced microbial growth with 26% surface hydrophobicity and 31% hydrolytic activity. Odusanya et al. (2013) observed the surface deformities of plastic when treated with S. marcescens; further degradation was evaluated by the reduction in glass transition temperature (Tg) and reduction in crystallinity via DSC analysis. Similarly, Ambika et al. (2015) identified a marine bacterial strain as Achromobacter denitrificans S1 for LDPE degradation that was determined by NMR, XRD, TGA and GCMS analysis. Das and Kumar (2015) investigated a sample of municipal solid soil for distribution of polymer degrading microorganisms and isolated Bacillus amyloliquefaciens BSM-1 and B. amyloliquefaciens BSM-2. Das and Kumar (2015) found enhanced biodegradation with strain B. amyloliquefaciens BSM-2 in comparison to B. amyloliquefaciens BSM-1. The rate and efficiency of polymer degradation were determined by pH alteration in media, CO2 evolution, weight loss, SEM and FT-IR analysis. Similarly, Gajendiran et al. (2016) isolated a fungus from landfill soil, identified as A. clavatus (strain JASK1). They exploited A. clavatus for LDPE degradation by incubating the samples for 90 days and evaluated the biodegradation by means of CO2 evolution, SEM and AFM analysis. Restrepo-Flórez et al. (2014) discussed the effect of biotic and abiotic factors on the initiation of polyethylene degradation by including enzymatic hydrolysis, photo-oxidation (UV light), etc. The number of carbons present on the polymer influenced the rate of degradation via enzyme interactions. Structural arrangements are also important in degradation; it was observed that amorphous regions are more susceptible to microbial attack. Thomas et al. (2015) reported three microbial species for polythene degradation, i.e., P. fluorescens, S. aureus and A. niger. They used P. fluorescens and evaluated the degradation in laboratory conditions as well as the field environment; 8.06% degradation was found within a month under laboratory conditions, and 8 and 16% degradations were observed in 9 and 12 months, respectively, in field conditions. Pramila et al. (2012) reported LDPE degrading bacterial strains isolated from the municipal landfill, i.e., Brevibacillus parabrevis PL-1, Acinetobacter baumannii PL-2, A. baumannii PL-3 and P. citronellolis PL-4. The polymer (LDPE) degradation potentials of bacterial strains were determined by the biofilm formation ability on polymers and CO2 evolution from the carbon mineralization of polymer. Muenmee et al. (2015) used a bacterial consortium (heterotrophs, autotrophs and methanotrophs) for HDPE and LDPE degradation and found Methylobacter sp. or Methylocella sp. (methanotrophs) predominantly on the surface of deteriorated samples. The LDPE degradation rate was reported as lowest in comparison to HDPE degradation. Muenmee et al. (2016) conducted an experiment for HDPE and LDPE degradation with type I and type II methanotrophs, heterotrophs and nitrifying bacteria. Degradation was accomplished under lysimeters in different environmental conditions. Muenmee et al. (2016) reported these microorganisms as prominent polymer (HDPE and LDPE) degraders, identified as Nitrosomonas sp. AL212, Nitrobacter winogradkyi, Burkholderia sp., Methylobactor sp., Methylococcus capsulatus, Methylocystic sp. and Methylocella sp. Duddu et al. (2015) studied 83 microbial isolates for biosurfactant production from oil-contaminated sites. Out of 83 isolates, the NDYS-4 isolate was identified as Streptomyces coelicoflavas 15399T and selected for LDPE degradation, showing 30% weight loss in 4 months and metabolic activity of isolates evaluated by TTC reduction test. Soil-buried LDPE showed active microbial growth on LDPE in 7–9 months, and surface deterioration was confirmed within 17–22 months as determined by SEM analysis (Mumtaz et al. 2010). Abrusci et al. (2011) tested the biodegradability of photo-degraded polyethylene through Bacillus cereus, B. megaterium, B. subtilis and Brevibacillus borstelensis at 30 and 45 °C. These microorganisms were isolated from soil-buried polyethylene films and B. borstelensis obtained from a German collection of microorganisms and cell cultures. Degradation of polymers was observed by means of biofilm formation and other deformities, characterized and confirmed by ATR, FTIR, chemiluminescence and GC-product analysis. The maximum carbon mineralization was found at 11.5% and 7–10% with B. borstelensis and MIX (a mixed culture of Bacillus cereus, B. megaterium and B. subtilis), respectively, at 45 °C. Devi et al. (2015) reported two fungal strains for polyethylene (HDPE) degradation via biofilm formation. These fungal strains were identified as Aspergillus tubingensis VRKPT1 and A. flavus VRKPT2. Biofilm formation and surface deformation as a result of fungal degradation were determined by epifluorescent microscope and SEM. Hadad et al. (2005) isolated B. borstelensis 707 from soil and exploited it for polyethylene degradation. They found maximum biodegradation with pretreated (photo-oxidation) polyethylene samples by means of reduction in molecular weight and gravimetric weight, i.e., 30 and 11%, respectively. Similarly, Fontanella et al. (2010) observed the effect of oxidants on LLDPE, LDPE and HDPE degradation. They used manganese, iron and cobalt as prooxidants in polythene; samples were placed for pretreatment by thermal method and photooxidation. They exploited Rhodococcus rhodochrous in the degradation of pretreated polymer samples. Bacterial activity and biodegradation were determined by adenosine triphosphate content and 1H NMR spectroscopy, respectively; surface alteration was confirmed by SEM analysis. It was found that accelerated degradation of polyethylene was observed for abiotic treatments that included thermo- and photo-oxidation. These treatments oxidized the prooxidants and helped polyethylene degradation. Exploitation of prooxidants as blended in polyethylene formation make it further susceptible to microbial deterioration. Husarova et al. (2010a) investigated biodegradation of calcium carbonate (prooxidant) containing LDPE. They found that prooxidant containing LDPE degraded (carbon mineralization) 16% in 80 days, while samples that did not contain any prooxidant were mineralized 7% in 13 months under soil and 23% in compost conditions. Mehmood et al. (2016) isolated bacterial strains from a solid waste dump and identified P. aeruginosa CA9, Burkholderia seminalis CB12 and Stenotrophomonas pavanii CC18; these strains were tested for modified LDPE [blend of titania (TiO2) and starch]. Out of three strains, CC18 showed enhanced viability and degradation. The reproducibility of degradation was examined by SEM, TGA, XRD and FTIR analysis, and bacterial growth was scrutinized by biofilm formation, salt aggregation test and cell surface hydrophobicity. P. citronellolis EMBS027 isolated from landfill soil of municipal sites showed LDPE deterioration (Bhatia et al. 2014). Sheik et al. (2015) reported Aspergillus sp., P. lilacinus and L. theobromae as endophytic fungi for laccase production and polymer (LDPE) degradation. They incubated fungal cultures with radiation (with different range 0–1000 kGy) irradiated LDPE samples and observed the reduction in intrinsic viscosity and average molecular weight. On the other hand, Shahnawaz et al. (2016) isolated Lysinibacillus fusiformis VASB14/WL and Bacillus cereus strain VASB1/TS from rhizospheric soil of Avicennia marina and reported them for polythene degradation. Microorganisms are capable of degrading inorganic and organic materials, and interest has been aroused to study microbes for their ability to degrade plastic polymers. P. aeruginosa, P. stutzeri, S. badius, S. setonii, R. ruber, C. acidovorans, C. thermocellum and B. fibrisolvens are the dominant bacterial spp. associated with polymer degradation. P. aeruginosa is one of the widely reported microorganisms for polymer degradation via biofilm formation with the help of alginate-like chemicals and quorum sensing signaling systems, i.e., Rh1I/Rh1R. Biofilm formation improves the degradation efficiency followed by the mineralization (polyethylene glycols mineralization) process. Pseudomonas aeruginosa CA9 is reported to have better biodegradation with LDPE, Pseudomonas sp. AKS2 is reported for biofilm formation on LDPE and biodegradation of LDPE via enhancing microbial growth with 26% surface hydrophobicity and 31% hydrolytic activity. P. stutzeri is reported for high molecular weight (4000–20,000) PEG degradation, and Streptomyces badius 252 and Streptomyces setonii 75Vi2 were more effective against heat-treated degradable plastics. Rhodococcus ruber has been reported to colonize and degrade polyethylene by forming a biofilm and hydrolyting enzymes. Polyethylene biodegradation was improved by introducing peroxidant additives in manufacturing processes that make it susceptible to in vitro thermal and photochemical mineralization. C. acidovorans TB-35 is also useful for polyester–polyurethane degradation through PUR esterase production and enzymatic hydrolysis. Gene pudA is the key gene from Comamonas acidovorans TB-35 encoding the enzyme PUR esterase. Fungi like A. niger, A. flavus, F. lini, P. cinnabarinus and M. rouxii are prevalently found for polymer degradation. A. niger produces acetyl xylan esterase, which works with the combination of endo-xylanase for efficient xylan degradation. A. niger and A. flavus are also suitable for the rapid mineralization of medium-length monomer units. A. niger is effective in polythene degradation, while Aspergillus flavus is reported for PCL as well as polythene biodegradation. Similarly, Mucor rouxii NRRL 1835, Aspergillus flavus and Streptomyces are also involved in starch-based polyethylene degradation. Fusarium lini is involved in synthesizing dehydratase, which is responsible for polyvinyl alcohol degradation with CO2 and H2O formation. P. cinnabarinus is also known as white rot fungus and is involved in PVA biodegradation in the presence of Fenton’s reagent. The above discussion illustrates the occurrence of polymer-degrading microorganisms. Hence, further studies on the screening of effective microbial strains are essential to minimize polymer risks for the environment. Both authors have contributed equally to the manuscript. Author VMP has carried out the data study. Author N guided him during the study. Both authors read and approved the final manuscript. This article does not contain studies by any of the authors on humans and animals. All associated authors are listed within the manuscript, and no other person satisfied the criteria for authorship. This work was supported by research Grant No.F. 25-1/2013-14(BSR)/11-13/2008 (BSR), University Grants Commission (UGC), India.